This lesson is all about the dative case. 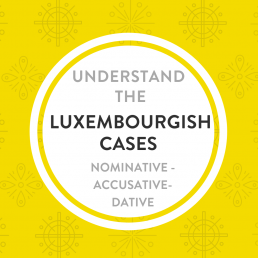 This is one of the 3 Luxembourgish cases. Ech “verb” ⇒ Ech liesen. – I read. Ech “verb+ something” ⇒ Ech liesen e Buch. – I read a book. Ech “verb + something to someone“. Ech “verb someone something“. ⇒ Ech ginn dir e Buch. – I give (to ) you a book. Many Luxembourgish verbs fit this pattern… ginn (to give), hëllefen (to help), erklären (to explain), soen (to say)... and the underlying idea is a transfer. Not transfer as in I move somewhere but something is being moved from one entity to another entity. And whenever we are looking at a situation like this, in Luxembourgish the thing being transferred is in Accusative and the receiver is in Dative. What matters are the roles. Dative is the receiver. That is its core. Receiving something. Dative receives. Ech hëllefen dem Mann. – I help the man. Den Dokter gëtt dem Meedchen e Medikament. The doctor gives the girl a medicine. Ech schreiwen nach séier engem Kolleeg eng SMS. – I quickly write an sms to a colleague. Ech soen enger Cliente Äddi. – I say good-bye to a customer (female). D’Educatrice äntwert engem Kand. The child care worker answers to a child. We don’t say “Wéi geet et du ?” no, no, no! ⇒ du (personal pronoun in the nominative case) becomes dir in the dative. Soll ech dir dat erklären? – Shall I explain this to you? Ech verkafen hinnen mäin Auto. – I sell them my car. Ech schécken hir Blummen. I’ll send her (formal) flowers. Ech soen dir, wat ech haut maachen. – I tell you, what I’ll do today. Ech liesen iech eppes vir. – I read something out to you (plural). Moien Här Weis, wéi geet et Iech ? – Good morning Mr Weis, how are you (formal)? The Dative isn’t really receiving a thing here… it is more like an audience for something. But still I think the idea of transfer shines through. Well, that is not wrong… if you use that to help you remember Dative that’s fine. But Dative can also express for you and from you and even more importantly, not every to you is automatically a dir. Watch the video of this lesson so to practice along with me (Übungen – exercises)! !